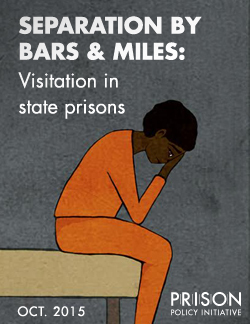 Easthampton, MA — Less than a third of people in state prison receive a visit from a loved one in a typical month, puts forth a new report by the Prison Policy Initiative, Separation by Bars and Miles: Visitation in state prisons. The report finds that distance from home is a strong predictor for whether an incarcerated person receives a visit. 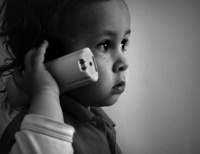 “For far too long, the national data on prison visits has been limited to incarcerated parents. We use extensive yet under-used Bureau of Justice Statistics data to shed light on the prison experience for all incarcerated people, finding that prisons are lonely places,” said co-author Bernadette Rabuy, who recently used the same BJS dataset for Prisons of Poverty: Uncovering the pre-incarceration incomes of the imprisoned. 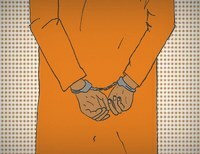 The report focuses on incarcerated people in state prisons and is a collaboration between Prison Policy Initiative staff and data scientist Daniel Kopf of the organization’s Young Professionals Network.